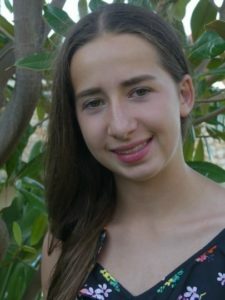 About the Author: Cadi is a bilingual (Welsh and English) 14 year old and from Cardiff in Wales, UK. She enjoys reading and is a huge Harry Potter and Dr Who fan. She is very musical and plays piano and flute to a good standard; she is a member of the county High Schools’ Orchestra. Cadi has stammered since learning to speak, but she doesn’t let this stop her from sharing her ideas and even public speaking. In September 2018 she was on Welsh ITV television news talking about living with Coeliac Disease. Her favourite subjects in school are Music, Drama and Art and she is thinking of a career making costumes and sets for theatre or TV productions. Last year I attended an intensive therapy course at the Michael Palin Centre and I am extremely grateful to everyone there who helped me with my stammer. Although I still stammer, I feel more confident talking about it to other people. I’ve learned what happens in the brain when I stammer, why I stammer and the different reasons why people stammer. 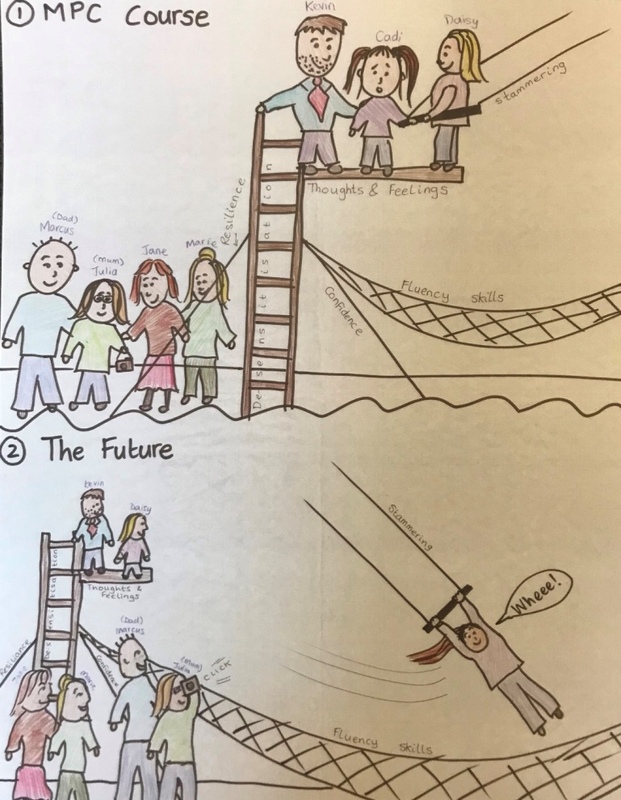 The picture that my parents and I drew is split into two: before and after the course. Previously that year, everyone on the course went on a circus day and we did various activities including the trapeze. My parents and I used this image in our picture, because before trying the trapeze, I was really nervous but after the first few times, I grew more and more confident. As you can see, at the top of the picture, is me (Cadi) standing quite nervous, not sure whether to go or not. Next to me are Kevin and Daisy, therapists from the MPC and they are helping me feel more confident and telling me that there is nothing to be afraid of. And if I do fall (which is if I stammer when I talk) the net (which is made of my fluency skills) is there to help me. Jane and Marie are helping my Mum and Dad not to worry. The second picture is of me swinging freely and not worrying. My Mum is taking a photo of me (as she often does). This is a perfect analogy of the course. Although I still stumble very often, I don’t worry as much about my stammer. Wow. This is so cool and impressive from a young person. I know many adults who wish and hope to develop the confidence to just speak and not worry so much about how they might sound or what others might think. You are on a great journey and you’re just discovering your many talents and where life will take you. When I was 14, I was desperately afraid to let other kids hear me stutter. It was just easier to pretend I didn’t have anything to say. Look at you. Expressing yourself on this international forum, showing you are talented and creative. I love the drawings and the fact that your mom likes to take lots of pictures of you. She must be so proud and I hope you are too. I work with teenagers your age I try to be a good role model and show that it’s ok to be our own true unique selves. Thank you so much for sharing this. Hi Pamela, this is Julia, Cadi’s mum. Thank you so much for your encouraging comments, which we read to Cadi. It’s true that I’m very proud of her, and our other two children, and that I do take a lot of photos of them! 😉 Cadi is very creative and so confident in speaking. Your message means a lot – thank you. Hi Cadi- Great job! I love this drawing and the thought that went behind it. It sounds like you’re on a great path with great things ahead of you! Way to go! Cadi here, thank you for that encouraging comment, it’s great to hear from people from around the world! Great leaps of confidence in different ways Cadi! Hi, this is Cadi’s mum here. Cadi is indeed brave in all sort of ways! When she was a small child I had to watch her as she would take risks climbing etc and I was afraid she would fall and get hurt. But as you say, it’s through taking risks that we learn to get up again after a fall. Now I am grateful for her confident outlook, as it has served her so well with her speaking. She is an inspiration! Thank you for your comments, which Cadi has read, too. Your drawing is a beautiful metaphor explaining the various dynamics involved in stuttering. It’s so impressive that at your age you have so much confidence and bravery. What is your best advice for people your age who stutter about having the strong confidence that you do? The botttom illustration makes swinging on a trapeze look to be a lot of fun! You really captured and conveyed the amount of joy you felt as your fear decreased (and fear in the first drawing). It’s so encouraging to hear that your therapy course has helped you become more confident and worry less about stuttering. I’m studying speech-language pathology in graduate school and could one day help other people who stutter as well. I’m wondering, have you found a helpful way to explain stuttering to other people your age? I love your drawing and admire your bravery! You’re drawing is very well done. It is very interesting to see your journey through overcoming your fears and now being able to enjoy who you are. Thank you for sharing. HI Cadi! Thank you for your lovely words and helpful analogy. I really appreciate your drawings and will be sure to use them in the future to help future patients. Thank You! What an awesome analogy you have portrayed here. I appreciate the bravery that you have shown all of us by sharing this experience. I love that you have included not only yourself but others such as family members and therapists in your picture to emphasize the importance of support from others in overcoming the anxieties and fears of stuttering. I am a graduate student in a speech language pathology program and currently in my off campus practicum, I am working with an 11 year old girl who stutters, she is having a difficult time with accepting her stutter and avoids expressing herself and communicating with others. If you don’t mind I would love to share this with her and if you have any other suggestions or words of advice that would help her become more comfortable with her stutter, please send them my way! Thanks in advance! This is a very cool illustration of your stammer. What is some advice that you have for your people with a stutter? What have you learned from your stutter? Thank you for sharing! Being able to not allow your differences define you in a negative way is probably one of the greatest challenges you can overcome. It is really amazing that you were able to use art as well to show that your family is always going to love and support you until you are ready to fly.